Jeopardy! hasn’t been a stranger to covering Star Trek before, but Tuesday’s episode might take the prize for hiding, in plain sight, one of the coolest The Next Generation references we’ve ever seen on the show. Viewers pointed out that the second round of Jeopardy included two categories that, by themselves, weren’t all that conspicuous. One was covering Shaka, the Zulu king and conquerer. The other was about war and conquest. However, when their powers combined, they took on a whole new meaning... one that seemed tailor-made for diehard Star Trek fans. 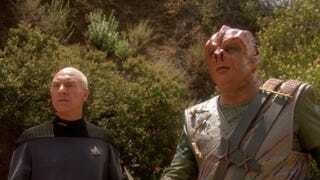 “Shaka, when the walls fell” is a reference to Star Trek: The Next Generation’s season 5 episode “Darmok.” The episode, a favorite of fans and critics alike, is about Captain Jean-Luc Picard learning to communicate with an alien race called the Children of Tama, who speak an allegorical language incompatible with Starfleet’s universal translator. The episode brilliantly tackles differences in language and thought, and the power of compassion and understanding. By the end of the episode, as shown below, Picard manages to tell the Children of Tama (in their form of language) that he and Tamarian captain Dathon successfully established communication— although Dathon ended up losing his life in the process. It was recorded in Tamarian history as the story of “Picard and Dathon at El-Adrel,” a testament to their hard work and cooperation.